Beautifull Green and Gold two piece dress, very elegant and Eye catching on stage! The Bodice is a rich green velvet with a gold sequined and embroidered neckline, and has a gold and turquoise embroidery down the center. 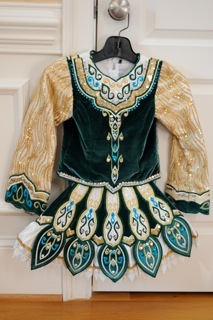 The skirt is a five panel green and perl with green, gold, turquoise and perl embroidery. The cape and sleves are gold sequined fabric. It has a row of clear swarsky crystals along thre waistline and a row of turquoise swarsky crystals along the neckline, with many more through out the whole dress. The dress includes two pairs of gold bloomers, a headpiece, and extra crystals.